After a big day on the water, sometimes it is easier to let someone else do the cooking! Even better when the two chefs cooking your catch are at the top of their game. Tairua's newest restaurant Marina Bar and Grill not only boasts the best view in town but their two resident chefs have an enviable resume. Both Ariki Hamilton and Kieran Russell have come through the ranks at George Calombaris' (Masterchef Australia's host) Press Club Melbourne. We rocked into the Marina Bar and Grill with some kingfish caught the day before, keen to trial their new 'Cook your Catch' service and keen to see a new take on how to serve up our favourite fish. We weren't dissapointed. The first dish of the day was kingfish sashimi, drizzled with Keiran's secret sashimi sauce (soy, sesame oil, lemon & fish sauce), sesame seeds, crispy shallots and coriander. The verdict? Absolutely to die for! Second course was gin cured kingfish with pickled cucumber, radish and a coconut sorbet. Delicious! The final dish of the day was a hearty slab of pan fried kingfish. Kingfish can be a tricky fish to cook to perfection, and the team absolutely nailed this one. The kingfish just melted as the fork went through it. 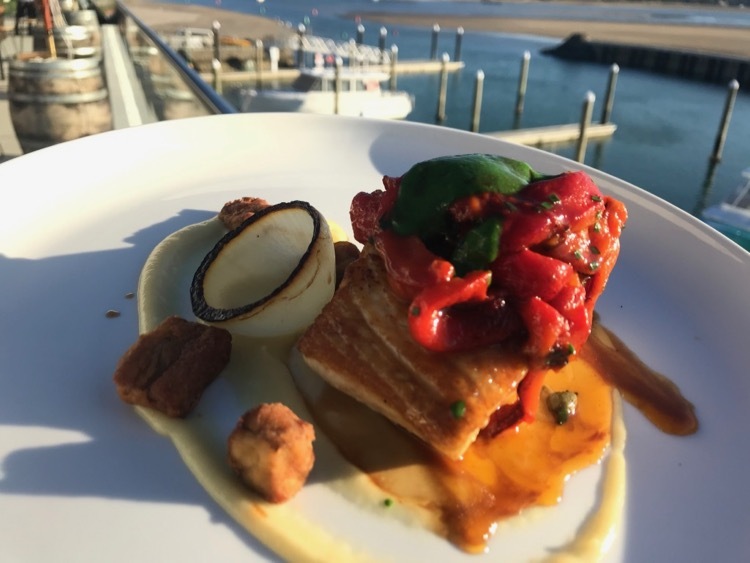 The kingi was plated with onion puree, roasted red peppers, capers, parsley and roasted chicken juices. The total cost of this epic 3 course kingi feast? A mere $25 a head. We washed down this feast with a selection of craft beers and ciders, all brewed in house at the Marina Bar's craft brewery. Leon Smith, co-owner of Marina Bar and Grill says the Catch and Cook service has gone down a treat this summer. "So far fishos and divers have brought in all sorts of goodness......bluenose, hapuka, snapper, yellowfin tuna, albacore, crayfish and scallops. " "We saw it as a bit of niche that no one else was catering for. Tairua is home to so many hunter gatherers, and being able to enjoy your catch cooked by our top chefs is the perfect way to pay respect to your Kaimoana. While people do like to get dressed up to come to Tairua's most modern venue, we're not a formal venue, so come as you are, even in your fishing clothes, we're in a marina after all!" No need to worry if you are not a fisho yourself, there's plenty of seafood goodness on offer on the menu at Marina Bar & Grill. "We work closely with Cloudy Bay Clams and we have fresh clams flown up to Tairua twice a week. We have a fish of the day and market fish which changes regularly." But the most popular seafood hit at Marina Bar and Grill is their Seafood Platter, which is priced at $150 - $175 and Leon says is starting to become known as their signature dish, especially for visitors to Tairua keen to sample some of New Zealand's seafood goodness. This decadent platter is heaped with half a crayfish, fish of day, steamed clams, steamed mussels, popcorn clams and tempura fish." "We've had a glorious summer, the best part has been the support from people we've had making the most of our venue and the primo view. We've been well accepted by the community and working in well with the other the restaurants. The other day we got pumped and were low on fries, Flock gave us couple of boxes, we're all helping each other out, we're all part of the Tairua experience, not competition to each other." The formula at Marina Bar & Grill is continually evolving, Leon starts fizzing telling us about other plans in the pipeline. A slow pit cooker is on the way, a new shared plate menu about to be launched, seminars teaching people how to brew their own beer and cider are planned. "We've got events, bands and guest speakers lined up going into the off season, conference centre facilities and a board room which can cater for 14 people. We plan to try and keep this place pumping through winter and will be open to the public Fri, Sat,Sun, Mon right through. In the meantime we're pumping each day through the rest of summer."